Rethinking conventional computer designs, which are decades old, the U.S. Department of Energy has set its sights on creating systems that could supplant today’s PCs and servers. The Los Alamos National Laboratory—best known for its work with nuclear weapons—is developing and acquiring new types of computers as it looks to replace conventional computers. 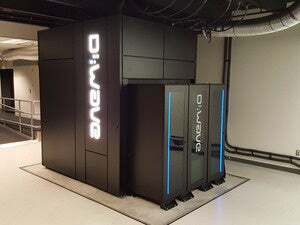 Its newest toy is a D-Wave 2X quantum computer, which the lab purchased from D-Wave Systems for an undisclosed price. The acquisition of the D-Wave quantum computer fits LANL’s goal to understand new forms of computing and how they apply to different applications, said John Sarrao, associate director for Theory, Simulation, and Computation at LANL. LANL is also researching neuromorphic chips inspired by the functioning of the brain. It is hard to predict whether, and when, neuromorphic-based systems will ultimately come to fruition, but work needs to be done to advance the aging computers of today, Sarrao said. The D-Wave machine will be used by LANL researchers to understand quantum computing and software applications. The researchers have already worked on the only two D-Wave quantum computers installed at user sites, both of which are in the U.S.
A lot of work needs to be done to build a fully functional quantum computer that can run a wide range of applications. D-Wave’s system is not general purpose, and has to be programmed for specific tasks. Unpredictability has kept a fully functional quantum computer elusive. Today’s computers store data in 1s or 0s, while central to quantum computers are quantum bits (qubits), which can store data in 0s, 1s and in both states. As a result, quantum computers are able to do more calculations simultaneously. But qubits are unstable, and research is on at universities and companies like IBM in materials, chip design and error correction to bring the pieces together for a viable quantum computer to replace today’s systems. LANL wants to contribute to those research areas through D-Wave’s system. The effort to come up with new computer designs will advance materials and physics research and help further develop supercomputing, which is vital to national economic, security, scientific and environmental programs, Sarrao said. LANL will still rely on its massive supercomputers for critical scientific research, but the research for new computers becomes ever more important as Moore’s Law runs out of steam, Sarrao said. Moore’s Law is an observation stating that the density of transistors doubles every two years, bringing big increases in computer performance. It has become a blueprint for the creation of faster, cheaper and smaller computers. Trying to boost performance while reducing power consumption and the cost of systems, however, is a “convoluted metric,” Sarrao said, adding that quantum computers could provide a new model to replace systems like Trinity, an LANL supercomputer due to go live next year. “We paid a lot more for Trinity than D-wave,” Sarrao noted. D-Wave systems are being used at Lockheed Martin, which shares the system with the University of Southern California’s Information Sciences Institute, and Google, which shares the system with NASA’s Ames Research Center and the Universities Space Research Association. The systems are suited for complex problems and could be used in finance, machine learning, logistics, pattern recognition and anomaly detection, said D-Wave President Robert Ewald. D-Wave is already working on improvements for a quantum computer that will succeed the 2X, which has more than 1,000 qubits. Ewald couldn’t provide a release date for the new system. “We expect ... more qubits, improvements in network topology, error and noise reduction, among other upgrades,” Ewald said.